JACK Cleveland Casino will ring in 2018 with tasty dining options, champagne toasts, exciting promotions, live entertainment, photo booths, thousands of free party favors and a casino-wide countdown. JACK Cleveland Casino’s seven-station buffet will celebrate the new year with delicious special menu options prepared by Chef Shane Brassel and his talented culinary team. New Year’s Eve dinner will be served from 5 to 11 p.m. and feature a variety of dishes, including herb crusted prime rib, crab, lamb roast, green bean casserole, crème brulee and seasonal cakes and pies. Following a casino-wide countdown, the buffet will offer a special “hangover” menu from 12 a.m. to 3 p.m. Guests can satisfy their late-night cravings with scrambled eggs, pancakes, fried chicken, chicken parmesan and mac and cheese. On New Year’s Day guests are invited to start the new year off right with a brunch buffet beginning at 10 a.m.
Nonna Pazza and Stack’d, the casino’s new fast-casual eateries, will also stay open for the entire night on New Year’s Eve. Nonna Pazza serves made-to-order pasta dishes and artisan flatbread pizzas, with all fresh ingredients and delicious sauces made from scratch. Stack’d offers guests outrageous hot sandwiches, street tacos, burgers, all-day breakfast options and more. 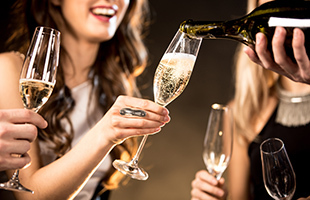 The champagne will be flowing on New Year’s Eve and guests can enjoy a glass for only $6 at any of the four champagne stations that will be set up in the casino. Revelers can also cheers to a new year at Legends Bar, located on level one, while enjoying music by a local DJ. Popular sparkling wine brand La Marca Prosecco will be taking over the bar to offer guests drink specials and free swag. The celebration starts early at JACK Cleveland Casino with exciting promotions leading up to the new year. On Dec. 29 at 8:30 p.m., one lucky guest will drive away in a 2018 BMW X1 SUV and nine winners will each receive $500 in free slot play. On Dec. 30 at 8:30 p.m., another lucky guest will drive away in a 2018 Mercedes Benz CLA 250 and nine guests will win $500 in free slot play. On Dec. 31 from 11 a.m. to 4:25 p.m., ten winners will each receive $2,018 cash to celebrate the new year. Guests must be 21 years and older to enter the casino.